As much as I’d LOVE to loll around in my velvet robe and sip on freshly squeezed OJ until I can muster the energy to face the world, a good amount of time involves being stuck inside, sitting slack-jawed in front of a hot laptop in the yoga pants I threw on because they were the closest thing to the bed. And then realizing by 2pm it might be a good idea to brush my teeth. It’s not pretty. And since moving to California and freelancing full-time, I’m still working out how to do it. Taking a break or carving out time for yourself when you work for yourself is a constant challenge. But sometimes that’s JUST what you need to recharge, re-energize and recalibrate in order to shake up that sad routine! Sometimes you just need to get away from it all and change your environment for a few days. And what is a girls’ trip away with two booze nerds without a signature cocktail? This was not a detox vacay, okaaaay. 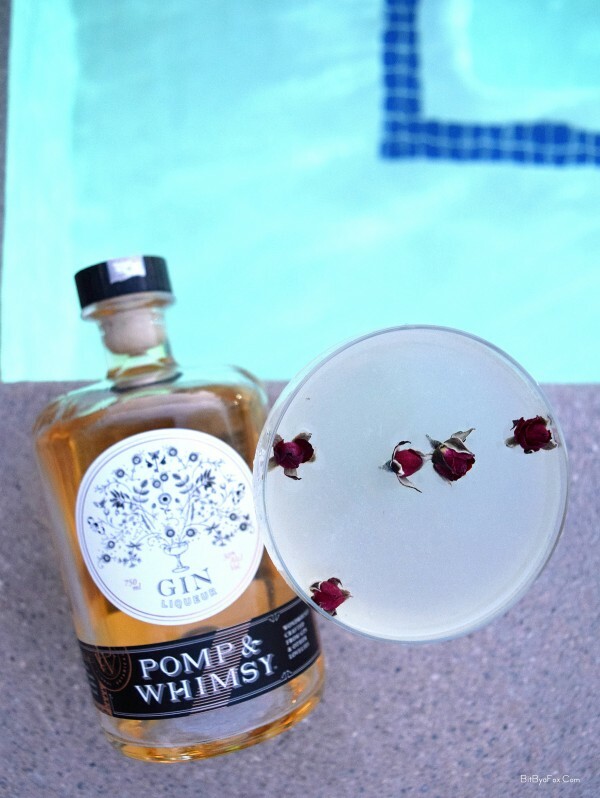 I brought along one of my new favorite discoveries, an exquisite new gin liqueur called Pomp & Whimsy that launched just this past January right here in downtown Los Angeles. 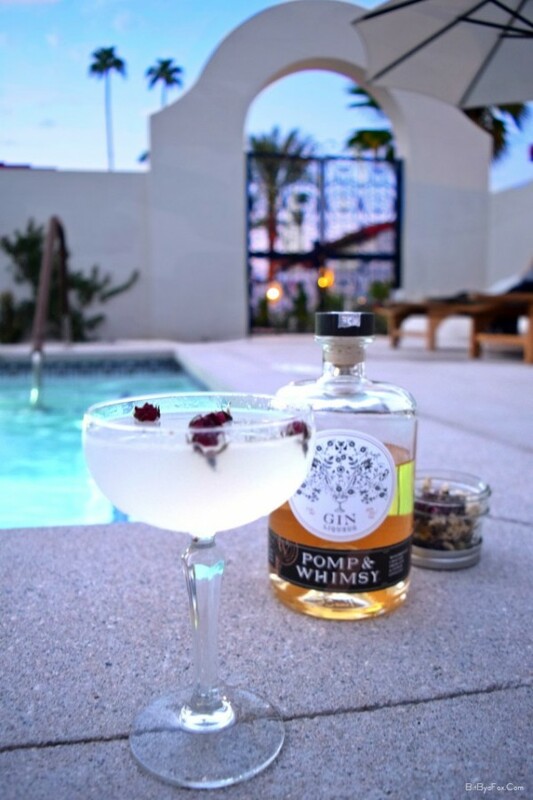 It is made by infusing classically distilled gin with a liqueur made up of 16 different botanicals, some of which include juniper, coriander, angelica, grapefruit, as well as bitter orange, cucumber, lychee, raspberry, lavender and jasmine pearls. 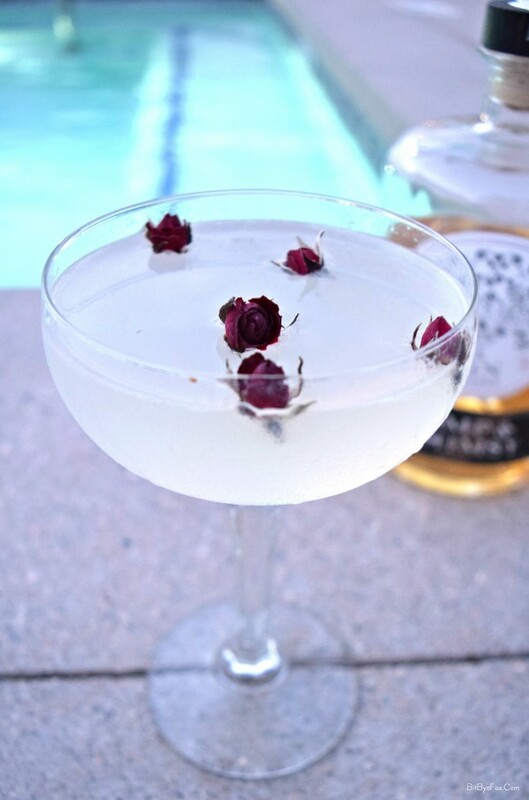 The resulting spirit is a fruity and floral perfume of flavors, a sort of lower alcohol hybrid of London dry gin and St-Germain Elderflower Liqueur. 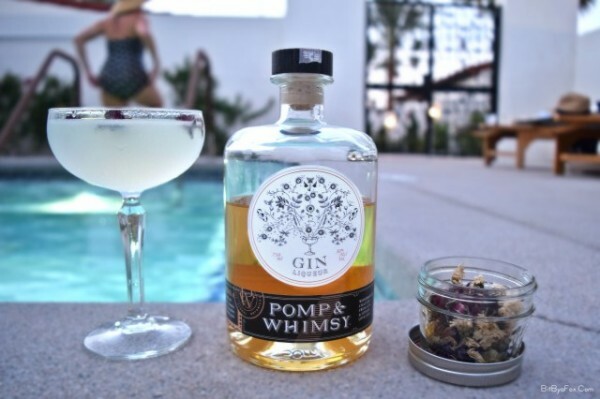 It’s wonderful as an aperitif with sparkling wine or seltzer, or, as we found out while indulging in our poolside villa, in a Pomp & Whimsy inspired Vesper. The Vesper, introduced in 1953 in the very first James Bond book, Casino Royale, is traditionally made with gin, vodka and the dry vermouth, Lillet Blanc. 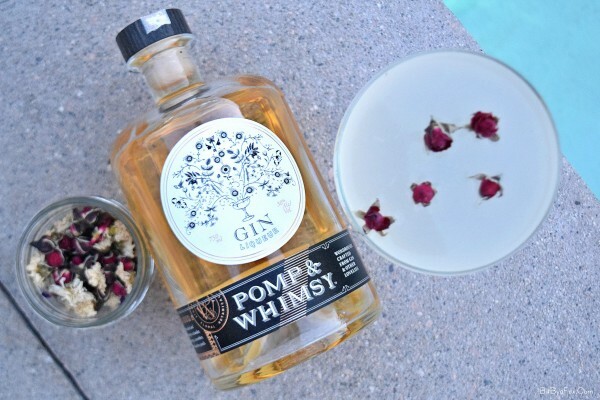 By using the Pomp & Whimsy Gin Liqueur in the place of a dry gin, the overall cocktail was slightly sweeter and more floral than a classic Vesper. The slight bitterness from the vermouth and higher alcohol and dryness from the vodka made for a perfectly balanced cocktail in the end. This version had a bit of a lychee martini quality to it. And I wasn’t mad at that. 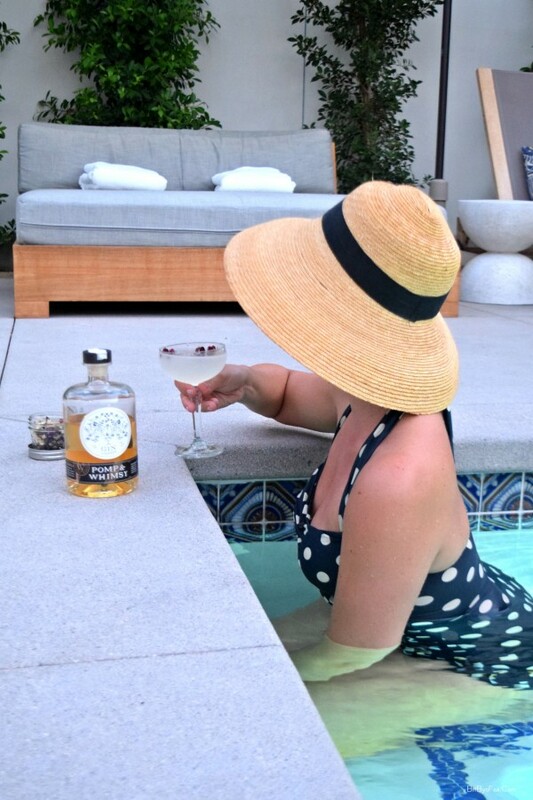 We fell in love with this drink as well as t he restored 1930s historic hotel we stayed at in Palm Springs, La Serena Villas. So, it was only appropriate to name it after this enchanting spot in the heart of downtown, flanked by the San Jacinto Mountains and towering palms trees. 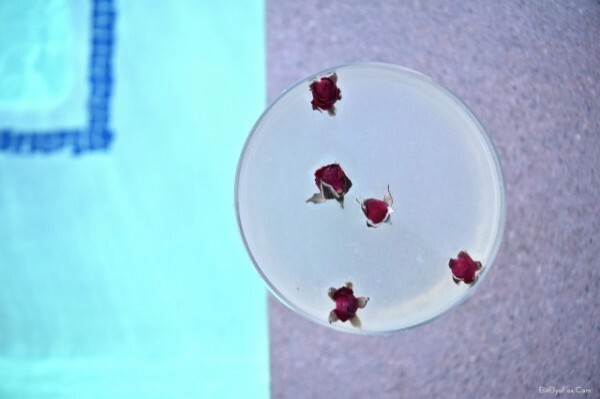 Here’s to spontaneous girls’ trips and girly drinks that even James Bond would love! Add all ingredients to a mixing glass and fill with ice. Stir until well chilled. Strain into a chilled cocktail glass. Garnish with edible flowers. 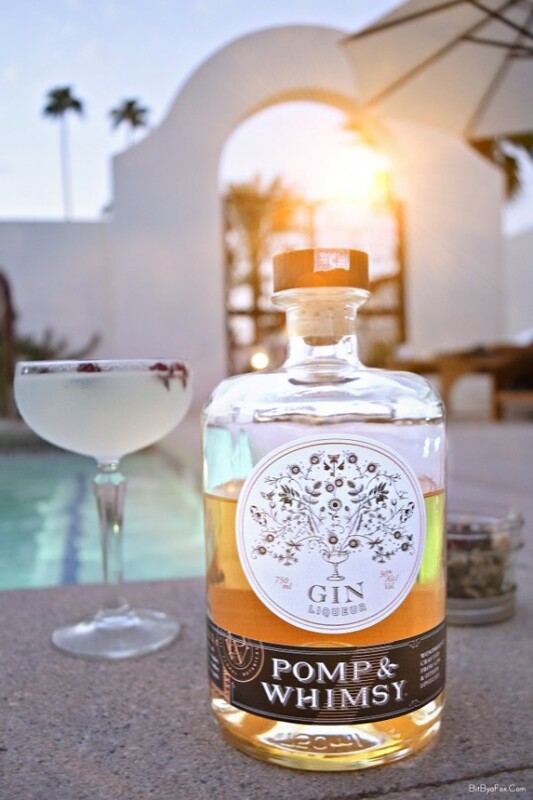 The post Pomp & Whimsy Gin Liqueur & a Vesper Variation appeared first on Bit By a Fox.